While we were in Galapagos last month we spent some time on Floreana Island, this is a small Island with a colorful past. We heard stories of Pirates and then took a hike to see their caves. We also heard stories from the 1930’s of a couple of nudists with metal teeth, and a baroness that moved in on them with her three lovers, and basically declared herself queen of the island. The first two people that wanted to make this little Eden their very own were the Wittmers, a German dentist and his mistress. They wanted to live there alone, were vegetarians and preferred to live free of the encumbrances of clothing, and their natural teeth. Before making the trip to live this solitary lifestyle they decided to pull out all their natural teeth, they had a pair (one pair) of metal teeth made which they passed back and forth as they ate their vegetarian meals. You have to love this story, it just sounds so crazy. The Wittmers died many years ago, but their decedents can still be found among the 125 people that now live on this tiny Island. Don’t fear they all wear clothes, and I didn’t see any metal choppers while exploring the island. The baroness that moved in on the two lovebirds, wanted to build a luxury hotel on the island for the rich and famous. Needless to say, once she moved in and started bossing the Wittmers around, things got a little messed up. She along with two of her lovers, and the dentist disappeared one day, and to this day nobody knows what happened to them. Long before all this took place, the pirates were active on the island, and they carved out caves in the highlands close to the only fresh water spring on the island. We went on a hike to see the caves; we also saw the only other unique carving of its kind found so far in the Galapagos, a human head which looks much like the ones on Easter Island. The Wittmers first child was born in one of these pirate caves. On the drive up to the highlands from the coast it was very interesting to see the different zones of vegetation, I believe there were seven. Along with the other Islands of the Galapagos, Floreana was formed by a Volcano, seeing the way the vegetation has taken over the landscape was a real treat. As we hiked through the woods in the highlands we saw many giant tortoises, they are fed regularly on feeding platforms throughout the wooded area on the way up to the pirate caves. The view near the pirate caves of the island and extinct volcano was breathtaking. One of the staff members from Red Mangrove that accompanied us on our Tour was from Floreana. He said that when he was growing up on the island there were only eight families (large extended families) living on the island. 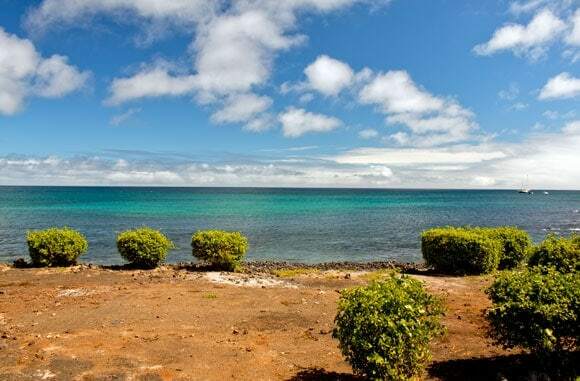 If you’re planning a trip, you should check out these Galapagos books. Anyway, have a great day. Your pictures are lovely! This is seriously an amazing story. I just read about Erica’s time spent there from the blog “To the sea”. I hope to visit someday. Pirate caves, and the history of it is like nothing else. To think there’s still relatives of the German Dentist…and wonder why on earth he wanted no teeth? More so – wonder where the heck he went! Hi folks; how are you doing? about that “G” movie, right up my alley. if you need an old guy who is witty and funny, and plays traditional country music. and likes to roam in the wilderness. You found him. Lol. So long for now Love from all. Mrs. Wittmer wrote a book called “Floreana” which described their life as settlers. P.S. The pirate caves were a project of Mr. Wittmer. Thanks Hugh – appreciate the first hand comments. Our facts are what we learned from our guide. Maybe it got juiced up a litter for the tourists – and confused along the way. If you’re interested to write a brief history, I would love to post it. Let me know. Thank you Dena for that exciting story about the metal teeth. Very interesting ……. I’ve been thinking. it has it’s good features. think of it this way. if one bit on a hard nut and broke a tooth or cracked it. one could have it welded . Or if one bent a tooth, just straighten it with a pair if vice grips. Wow. Love those stories. I just don’t get the metal choppers. I mean, whats problem with our own teeth! But, so so crazy! Gotta be real, too strange to make up! Love the pics! I know, what a crazy story! And if they ever wanted to go back to civilization they could just hold the teeth up to the sun, catch a glint and flag down a passing boat, right! These two had it all figured out.